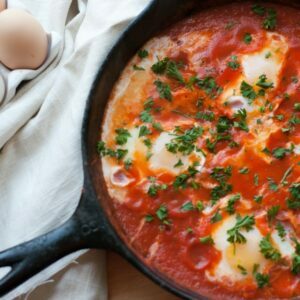 Recipes like this go over so well with my kids. Give them a bowl of rice or salad greens, a bunch of toppings they can choose from, and they’re happy campers. I loved this coconut vinaigrette so much with this salad that I reached over and gave each kids’ salad a drizzle. Without asking first. I know, I expected some lash-out, too. And I got a little. But then they tasted it. I totally won that round. 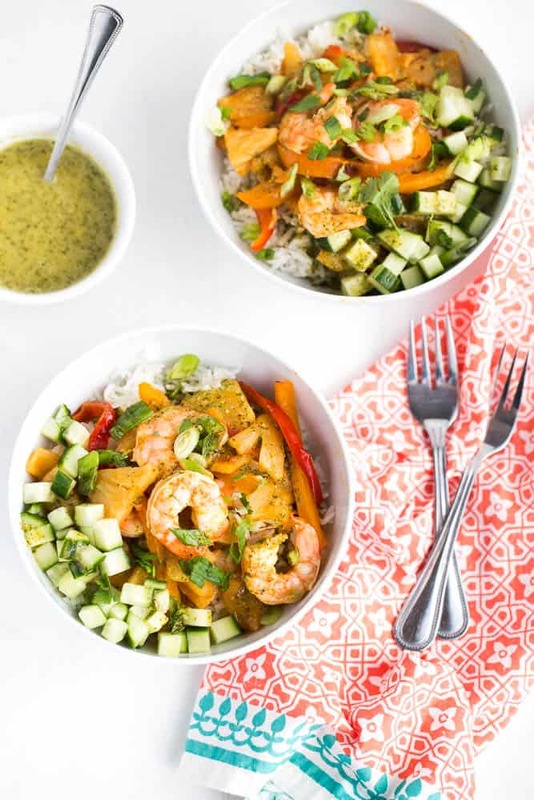 Piled on top of salad greens, cauliflower rice, or jasmine rice with some cool chopped cucumbers and a drizzle of coconut vinaigrette… *swoon* It’s such a wonderful combination. I feel like I tell my kids a million times that when you taste things all mixed together (instead of dissecting it) it’s so much better. The whole is greater than the sum of its parts, yo. Luckily they inhaled these bowls. And I’m grateful they like avocados (or at least guac), because I would question our biological relationship if they didn’t. I’m convinced that avocados will improve almost anything, and if I have a ripe one in the house it WILL get used (even in ice cream), but I realize that if I don’t reign in my avocado obsession my blog would turn into Perry’s Avocado Plate. Not necessarily a bad thing, but not what I’m going for. I had intended to throw some avocados on there, but my planning wasn’t stellar (and I didn’t have a ripe one) so, I didn’t. And guess what? It was super good. If you have a lonely avocado you could still give it a good home right on top. 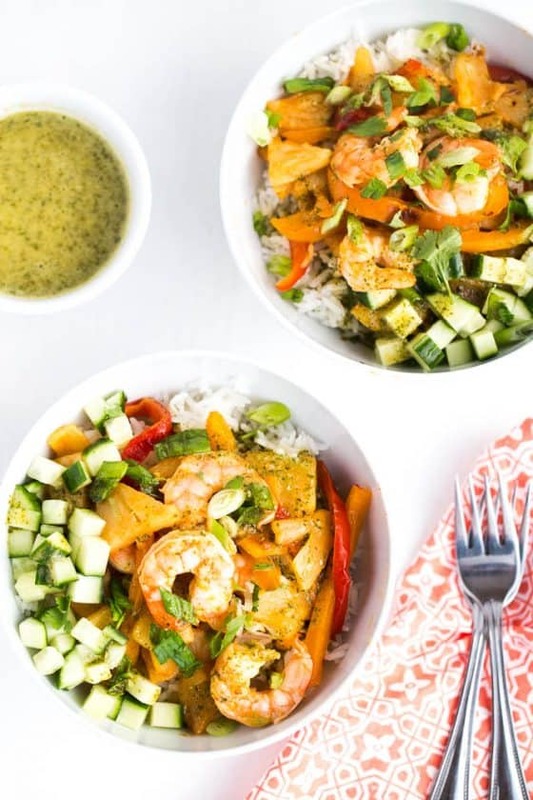 If you’ve got extra shrimp laying around, throw it into this Easy Jalapeno Shrimp Veggie Bake by Lindsay at Cotter Crunch. 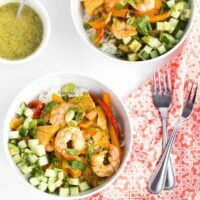 I love how bright and fresh her recipes are! 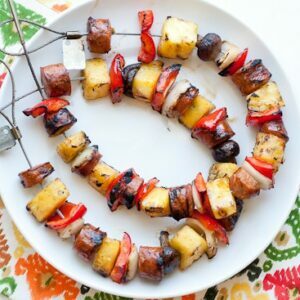 The shrimp, pineapple, and bell peppers can also be grilled on skewers or in a grill pan for extra smokey flavor! Place the pineapple, bell peppers on a rimmed baking sheet. Place the shrimp in a bowl. Sprinkle the shrimp and vegetables with a generous pinch or two of sea salt and black pepper. 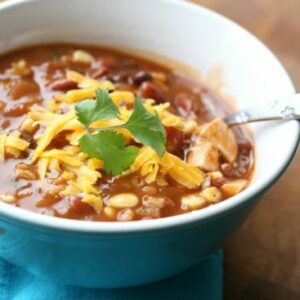 In a small bowl mix the rest of the ingredients in the top section (lime juice through avocado oil). Mix well, then pour half of the mixture over the pineapple/peppers and half over the shrimp. Toss each to combine. Broil the pineapple and peppers for about 15 minutes, until they're mostly cooked through and are starting to develop color on the edges. Flip the pineapple and peppers around on the pan and add the shrimp to the hot pan along with the remaining marinade. Spread everything evenly in the pan and broil for another 5-6 minutes until the shrimp is completely pink and just barely cooked through. Remove from the oven and set aside. Prep the remaining bowl ingredients and garnishes. Put a layer of salad greens or rice in the bottom of each bowl. 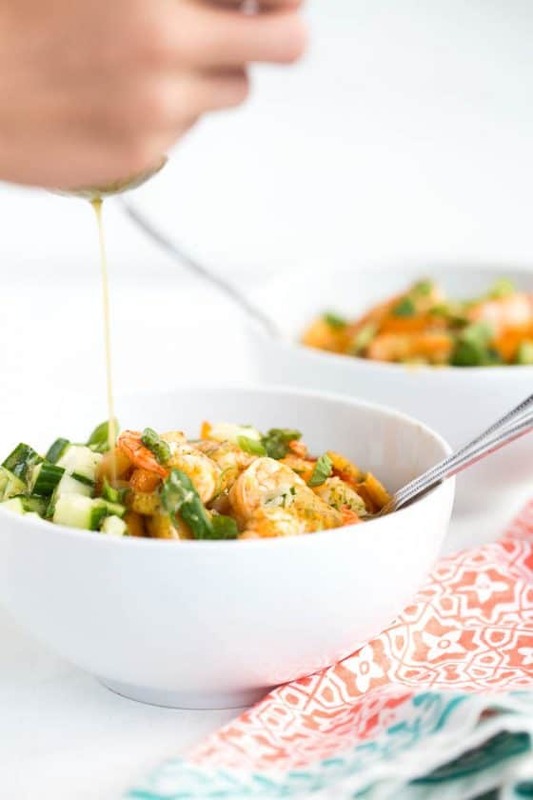 Top with shrimp and pineapple mixture and sprinkle on desired garnishes. Add a drizzle of dressing over the whole thing. To make the dressing Whole30 compliant, use one chopped date in place of the honey. Blend extra long to get that date incorporated into the dressing! Using coconut cream will give the vinaigrette a more pronounced coconut flavor, but coconut milk is good, too.